Many Struggle With The Holiday Blues… So Here’s To A Better December. 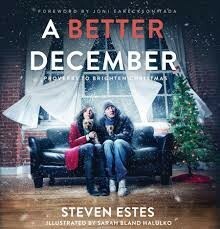 Author of A Better December offers words of comfort to the hurting during the holidays. Steve Estes uses Proverbs to bring understanding, consolation and even some hilarity to your holidays. Estes understands that some have lost loved ones or have gone through divorce and now are dealing with single motherhood during this “season of joy.” The author offers some perspective in A Better December that can help heal the hurts. Estes admits part of the problem is due to memories of the past that seem better than the present; or, Estes says many women struggle with comparing themselves to others who seem to be having so much holiday fun with their families.